Also, want ever more Potter, then visit Pottermore.com. Huh, didn’t know about most of these, awesome find! i want to know where the Australian wizarding school is? If there isn’t one then rip the owl that has to give us the letter. But we are not entirely unlucky. I’m a kiwi and there is a dragon native to NZ that often migrates to Australia. There isn’t one so far, but the closest one to Australia is mahutokoro. Why is there no magic school in Australia? I need to know how to defend myself against the dark arts called spiders. possibly either somewhere in the Northern Territory where Indigenous culture and old practices are still thriving, or central Australia, where muggles are less likely to find them. There’s a great episode of Melbourne based podcast “Plumbing the Death Star” where they design an Australian magic school. Their version is in the middle of the outback, with class buildings separated by open ground, and to match the danger and whimsy of Hogwarts, there’s wild animals (magical and mundane) all over the campus. The Australian school is actually called Boganmagico! She released this information in a recent tweet. Maybe, Australia will be the setting of Fantastic Beasts 3 and this is her very JK way of telling us. I’ve heard it’s Boganmagico. I checked JK’s twitter she confirmed it, and people are ALL over it. What about The Salem Witchs’ Institute? That’s a women’s organisation, not a school. I didn’t know there was a house in Japan😱😱😱mind blown!!!! Not a house because houses are groups kind of. So, they are clearly not students. if you speak Spanish, what? do you know how many people speak Spanish in the whole world? Probably banned by muggles as china isnt a big fan on supersitition. My guess is that China has a school and so would Australia, and possibly one in India or the Middle East. If there are 11 schools what are the other 3 and where are they located ?? If there is a school in America then how come I haven’t been accepted yet? What he means is, you’re an American Muggle, called a No-Maj.
Lol if there’s one in Britain how come I haven’t got 1,000 owls outside my place???! I hope there would be main schools in Asia that we can attend to. Like in the Middle-East or East Asia, but that would be too difficult because of the languages. There should be some sort of magical language that only witches and wizards can understand, so that we would be united in a certain region as a whole and be able to understand each other. I think there’s a spell for multi-language understanding. My guess is that out of the 3 that haven’t been revealed that one in in Australia, and one must be in the Middle East. The last one I haven’t even a guess about where it would be, it isn’t Africa since the school there takes students from the whole continent and is the school with the highest population. Anyone agree on my guesses about the 2 possible locations of the 3 yet to be revealed? And their guess on where the 3rd could be? China or India would be my best guesses but I’d think the Middle East school would take students from India, unless because of the population in India they have so many young witches and wizards they need their own school, same goes for China. The Third one I’m assuming is in the Middle East. That “coven,” is called the Order of the Phoenix. I think there really has to be a Spanish speaking wizarding school. Brazil is an odd choice for a wizarding school for me since they are one of the very few countries in central and south america that don’t speak Spanish. But since the school in Brazil is confirmed, I strongly believe that there would be one more wizarding school somewhere in Latin America for the immense Spanish speaking population of the world. Furthermore I completely agree with the broadly stated opinion that there has to be one in the Middle East for the large Arab population. Also I believe students from countries in Northern Africa would rather go to the Middle Eastern school than to the African school since the Arab culture is closer to them. Some may even go to Beaubatons considering that french is a common language in the maghreb countries due to colonial history. 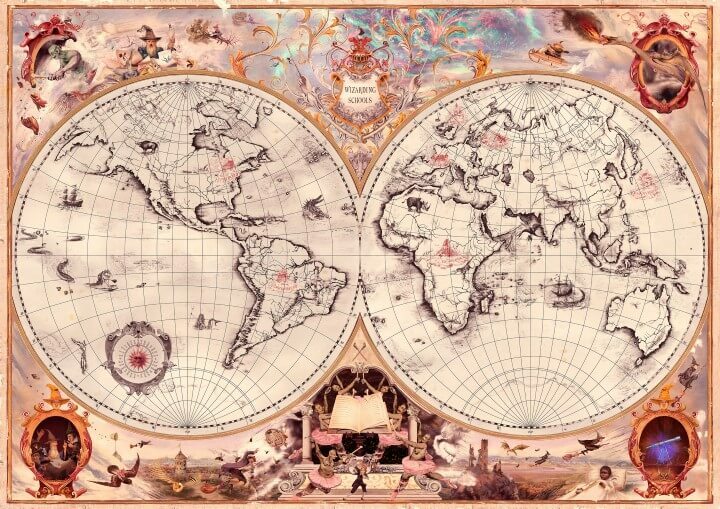 The last wizarding school in my opinion would have to be in India or China. Maybe somewhere in the Himalayas since that would probably be a good hidden location but nice and centrally in Asia. I think this is highly logical since they have such huge populations and therefore would certainly need a wizarding school. I know this will be unpopular but logically thinking there should not be a school in Australia (or NZ). (If there were 12 schools then I would say there is one, but with just 11 all other locations seem way more important) There are already 2 English speaking schools in the world where kids from Australia and NZ could be sent if their parents don’t mind the distance. Otherwise they would go to one of the Asian schools. It would depend wether similar culture/language or closer distance is more important to you. Certainly all schools would have developed their own transportation system for students, probably much more elaborate than the Hogwarts express. (Maybe some massive flying carpets could be involved since they are known to exist in the HP universe and have just been forbidden in Britain.) Also given the transportation the Beaubatons and Durmstrangs use, complex and unknown transportation seems highly likely to me. It don’t think it is a problem that we don’t hear about them since schools are known for keeping their secrets well hidden. I reckon that the last three schools are in Australia, India and either at the top of Russia of Canada. Canadas insitute would teach camouflage and trickery. ( how to secretly do something, how to find stuff out easily, how to pretend to be someone you are not etc). Russias school would tech extreme spells, overpowered techniques/ perfecting techniques and multiple shelter/defence/self helping spells. just ideas tho. It would be cool if J.K released what the last real schools are.